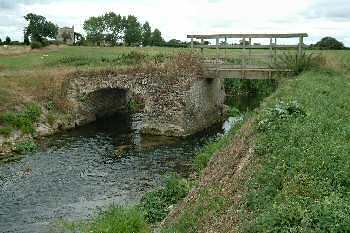 Pentney watermill originally belonged to the nearby priory. When the priory closed and the village moved towards Narborough, the mill became quite remote from the village and this probably contributed to its demise during the 1800s. A smock_windmill stood about half a mile to the north east. The base of the building was constructed using locally made white brick. It appears probable that the upper storeys were also constructed of the same material. 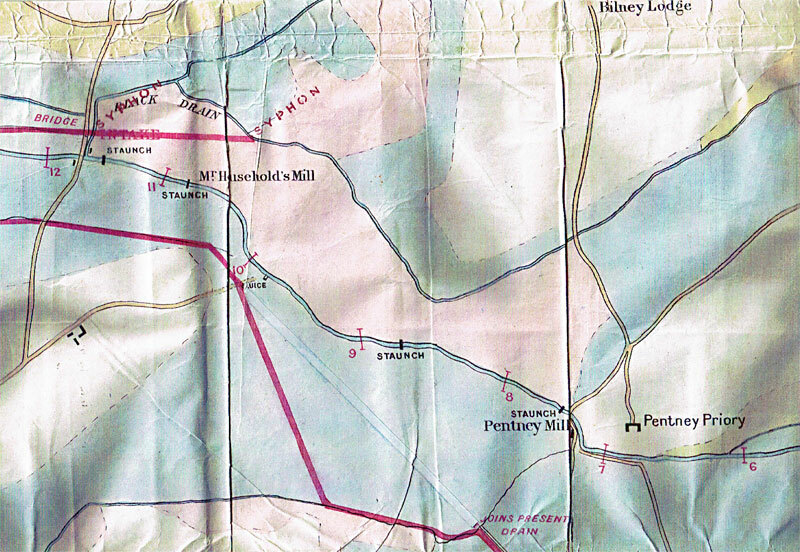 Faden's map of 1797 shows the mill as Pentney Mill whereas Bryant's map of 1826 shows the mill as the Windmill Inn. It is possible that the building took a change of use or at least an additional use by taking advantage of the opening of the Nar navigation in 1759. 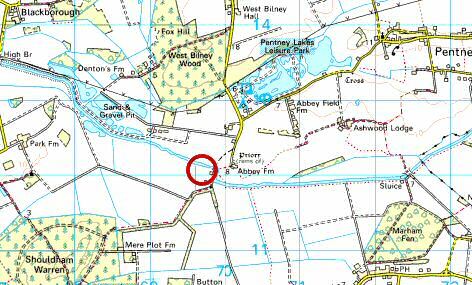 However, navigation on the upper reaches of the Nar above Narborough_Mill as far as West Acre was relatively short lived and had probably closed by 1810, although navigation to Narborough remained open until about 1885. During the 1800s the work of the watermill was doubtless taken over by the windmill some half a mile away. Up until the 1800s, the lane leading to priory was lined with houses, most of which had been built to house those working for, or trading with the priory. Doubtless many of the occupants would walk the few hundred yards to the Windmill Inn. The mill is listed as a pub in several directories published during the 1800s. Pub landlord, William Ranns was mentioned an inquest of December 1858. 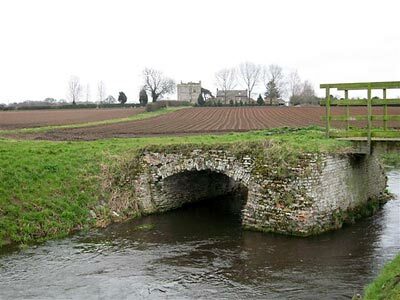 One Thomas Valentine had died by drowning and it was alleged by some that he had fallen over the bridge into the river after having been struck by William Ranns. Thomas Valentine was born 1818 in Westacre, Norfolk and died 6th December 1858 in Pentney. He married Charlotte Codling 8th September 1839 in Pentney, daughter of Henry Codling and Elizabeth Garrett. She was born 20th May 1821 in Pentney England and died 12th August 1890 in West Bilney. 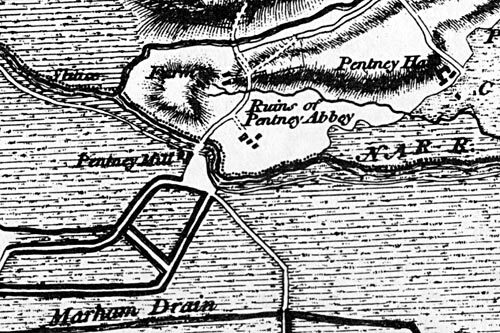 Considerable excitement has been occasioned by the discovery in the river at Pentney on Wednesday last, of the body of a man named Valentine, a gamekeeper, and son of Mr Valentine, farmer, of Bilney. 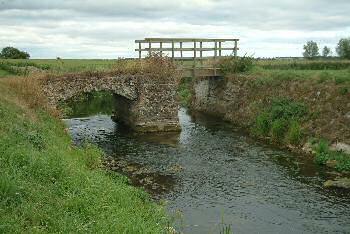 It seems that he was last seen on Monday night at the public-house kept by Mr Rann, at Pentney and on Wednesday afternoon a boy passing a bridge at no great distance from the public-house, saw a man's arm projecting from the water, and on assistance being procured, the body was found to be that of Valentine. The coroner has directed a post-mortem examination to be made, and the inquest is being held at the time we go to press. An Inquest was held before T.M. Wilkin, Esq., coroner, and a respectable jury, at the house of Wm. Ranns, known by the sign of the Windmill, Pentney on Friday last, 10th December, on the body of Thomas Valentine (aged 42), a gamekeeper, who had been found dead in the River Nar, near the Windmill, on the preceding Wednesday, under circumstances which at the time excited some suspicions. Edward Morton, laborer, Pentney, deposed; I knew the deceased, and last saw him alive at the Windmill a little after nine o'clock on Monday night. I was drinking with him and Jerry Dye at the Windmill for about an hour previous. Valentine was sitting by the fire in the kitchen when I went away. He was not drunk. I was employed on a gang of lighters, which was at the time made fast to a post about 10 yards from this house. There had been no quarrelling in the house that evening. Ranns was in the kitchen when I went away. He was sober. Ranns and Valentine were the only persons left in the kitchen. Dye is now in Lynn. He and I went away together. After I had left and gone aboard the lighter, went to bed directly. I did not hear or see anything all night. At about half-past three in the morning I went after my horses to get ready to start. It was a starlight night when we went out of the house. Valentine would have to go over the bridge to go home. It was not dangerous bridge to go over. It was sufficiently light for a sober man to have steered clear of the river. I had seen a servant girl in the house in the evening. She was in the bar along with Mrs Ranns. I heard Ranns say to Valentine that he (Valentine) owed him some money. Valentine admitted he did. Nothing else passed about it. There was nothing unpleasant between them. I saw Valentine change half a crown and pay for two pints of beer and half an ounce of tobacco. Valentine appeared in good spirits and sang part of a song. He was laughing and talking as jovial as could be. Sarah Ann Parnell: I live servant to Mr Ranns at the Mill. I knew Valentine. He was here last Monday night. I saw him come in. Valentine was a little freshy; but was not past his guard. He could go very well. I heard him call for a pint of beer. It was past 11 o'clock when he went away. I was up-stairs at the time. I and my Missis had gone to bed. We went at 11'o'clock, leaving the deceased, Morton, Dye , and Rivett in the kitchen with my Master. (Witness was cautioned by the coroner not to answer too quickly.) I won't be sure about Morton. I don't know what they were doing. I did not go out of the bar. Valentine was not drunk when I went to bed. After I got upstairs I could hear everything that took place. I heard Valentine swearing at my Master and my Master said he would give him a bang on the head if he called him so any more. Valentine called him a B------d B------. Upon that I did not hear my Master do anything. I did not go down. I did not see my Master strike him. I have not said to any one that I did. There was not not much of a row. Valentine did call my Master so again; and I heard my Master tell him to go home. I then heard them both get up and open the door and go out. My Master was not gone long, - a very few minutes. I was in bed when he came up-stairs. I was not when he went out. I am sure my Master was not gone 10 minutes; and after he came back I heard Valentine singing, and I did not hear any more of him. He seemed to be going past the house. My Master and he seemed to go out perfectly friendly , and I heard my Master bid him good night. He said "It's nice and starlight; go home." I heard my Master on Tuesday say he had given Valentine a bang on the head for swearing at him. I have not told any one that I saw my Master strike him. I don't think I could of heard a blow struck. Dye, Rivett and Morton went aboard the lighters five or ten minutes before there were words between my Master and Valentine. I did not say anything about this to anybody the next morning. I was talking about it yesterday. I was telling that he was in here and got a bang on the head; but I never told anyone I saw my Master strike him. None of the party appeared to me to be tipsy. My Master said he struck Valentine in the house, sitting on his chair. He mentioned it the next morning about nine o'clock as near as I can say. I was then getting breakfast. My Master left the door open when he went out with Valentine. When he returned he went up straight to bed. He got up the next morning whilst I was out milking. I recollect Mrs Valentine coming between one and two o'clock on the Tuesday. She saw my Master. I did not hear what took place. Mrs Valentine did not go away till about 5 o'clock and my Master then went to bed. He generally goes to bed between five and six, but does not get up again. [By the Jury:] I did not hear my Master use any angry expressions to Valentine. Valentine was not here before nine o'clock. My Master only said "D------ you, Tom, if you call me that any more I'll give you a bang on the head." He did not use any bad language. [The Coroner observed that the blow seemed to have had an extraordinary effect, as it made Valentine merry and made him dance, and restored peace between them.] I don't think one of the party were worse for drink. I heard Valentine singing outside as long as I lay awake. The jury stated that the deceased would have to go over the bridge to go home, and would then have to go straight forward. The side of the past the bridge would be very dangerous, but he would not have to go that way. 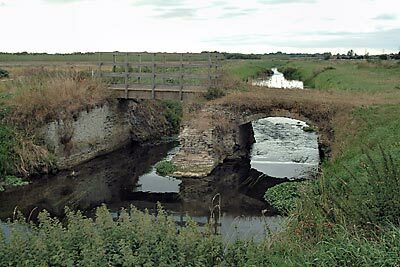 If he fell in at the bridge, the stream (when the stanches were drawn for the lighters) would be sufficient to carry the body to where it was found - about 25 yards below the bridge, - the bridge itself being directly opposite the corner of the public house. It was observed that the fence of the bridge was low enough for a drunken man to fall over. Witness [by the jury:] I heard my Master say he "banked" the gate of the bridge after Valentine [the gate being at the end of the bridge next to the house]. Valentine seemed as if he had come back again, but I did not hear the gate go. It does not make any noise. Wm. Ranns: I keep the Mill at Pentney, and have done so 10 or 11 years. On Monday night last Valentine came to the house about 7 o'clock, as near as I can think. (He had called in the morning on his way to Marham and had half-pint of beer.) When he came there were in the house myself, Morton, Dye and Rivett. He was sober. The five of us had five pints of beer together, and Valentine paid for two of them and half an ounce of tobacco. Dye, Morton and Rivett went aboard the lighters to get their suppers I should think about 10 o'clock. I cannot say exactly. They did not return that night. Only Valentine and I were left in the kitchen. We had not any more beer. I unlaced my shoes for going to bed. Nothing unpleasant occurred between him and me. I went to the door and looked out, and Valentine went through, and I then bid him a very good night and he did the same to me, and I banked the gate. After I got upstairs to bed I heard him singing on the bridge, and he was doing so till I went to sleep, - I should think that was for 20 minutes. Before the watermen went away, Valentine called me an old B-------, but that I did not pay much regard to, - not a bit. I don't think Morton was present then. I should think he had gone out to attend to his horses. I think Dye and Rivett were present. There was no talk about punching heads at all. I did not strike Valentine. I did say to him; "If you call ma a B------- any more I'll hit you." He did not do so again. We were very comfortable together. I have not said to anybody that I hit him a punch to the head. You would of seen that if I had, because there would have been marks I should think. I should think I was not gone out of the house three minutes before I returned again. Charlotte Valentine: I am widow of the deceased Thos. Valentine. He was 41 years old last February. I last saw him alive on Monday morning, at 9 o'clock. He appeared in good health and spirits. He was going to Marham with game. I was rather surprised that he did not return on Monday night; and on Tuesday afternoon I came here and saw Mr Ranns. I did not ask him anything. He asked me what time my husband got home. I said I did not know, - I was asleep. Ranns told me he had given my husband a bang on the head, or a lump on the head, but did not say what for. He asked me whether my husband had told me of it, and I said I had not had any talk with him. My husband, being a keeper, is very often out all night. I stopped at the Mill an hour and a half or two hours. I don't know that I have heard of any ill-blood between my husband and Mr Ranns. He has talked against my husband to people, but I very seldom see him. Of late years my husband has been a sober man. I have been married to him 19 years. [By the Jury;] I made inquiries at various places after my husband. I did not know but what he was after his business. I did not like Mr Ranns to know but what he was at home that night. James Kerry , a labouring lad, sworn: I am employed by Mr Ranns. 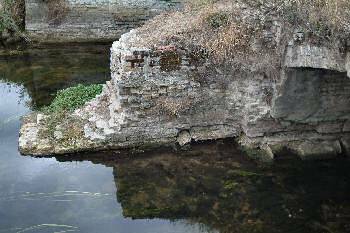 In the afternoon of Wednesday last, between 3 and 4 o'clock, I saw the body of deceased lying in the River Nar, about 20 yards from the bridge. I told my master, he said, "What, boy?" I took him to see it, and he said when he got round the corner of the house and saw it that he thought it was a log of wood. He said so because Missis was shrieking out. My Master helped to pull out the body, with Mr Lake, Mr Powley and Mr Hogg. I sleep in the house. I did not hear anything of the singing on Monday night. I went to bed just after 7. Mr T.M. Kendall, surgeon: I have this day made a post mortem examination of the body of the deceased. I discovered no external marks of violence on the head or any other part of the body. The brain was in perfectly healthy state. What is called the base of the skull was fractured across from one side to the other. That would not necessarily cause immediate death. It would kill, but not perhaps immediately. It might have been caused by a fall. I could not tell whether it was done when he was alive or dead. A portion of the sphenoid bone was broken off. I think it is very probable that the fracture might have been caused by a fall from the bridge, or on the ground. A man would not be likely to sing after it. The placid expression of the countenance particularly struck me; and there was every external appearance of the deceased having been drowned. I examined the lungs also. The right one was chronically diseased, but that was not the cause of death. The stomach was very full, containing at least two pints of food partly digested - meat and bread and fluid, but there was no smell of liquor. In my opinion the cause of death was drowning. There was no appearance from the state of the stomach of the man having been drunk. Mr Headley assisted me in the post mortem examination. If the fracture had killed, and the body fallen into the water, it would have presented a different appearance. My opinion is that he was alive when he entered the water. The fracture might have been caused by the fall into the water. A Juryman: If he fell in from the bridge he would fall into deep water. Another Juryman: He might of fallen against the lighters. Mr Kendall: Not without showing some external mark. Mr Jno. Headly, of Gayton, surgeon: I assisted Mr Kendall in making the post mortem examination, and I entirely agree with his evidence. The Coroner then summed up. He observed that if Ranns had known that he had done anything improper to deceased, it was very unlikely thing that he should tell Mrs Valentine the next day that he had given her husband "a bang on the head." Ranns now said he did not tell her so, and it was probable that he had forgotten it. It might have been said in a joking way, and so left no impression on his memory. It was well known that the place was a very dangerous one; and although the deceased was perfectly sober he might of fallen into the water. If so he was accidently drowned. But the Jury need not limit themselves to that; they could if they pleased find an open verdict to the effect that he was found drowned, but by what means he got into the water there was no evidence to show. At present, he (the coroner) did not see the slightest suspicion of any foul play, but if anything should turn up hereafter the police could take it up. One very important thing was that the deceased had money about him [2 ? odd] when he was last seen, and that it was all found safe in his pockets. If he had been attacked by anybody after he left the house it was probable he would of been robbed. or if he had fallen in with poachers and got a blow on the head, there would have been external marks, the absence of which was a peculiar feature in this case. It was, however, a very proper case for investigation, if the only result were to show that there were no grounds for suspicion. "That the deceased was found drowned; but how he came into the water there was no evidence to show." The deceased left a family of 5 children. It was stated that he was a very quiet man and much respected in the neighbourhood. i. JAMES (JIMMY) WILLIAM VALENTINE, b. 25 Jun 1853, West Bilney, Gayton, Norfolk. Reg. district Freebridge Lynn. England; d. Great Stambridge; m. SARAH ANN HAMMOND, 28 Jun 1875; b. 06 Mar 1857, East Winch,Norfolk England ; d. 27 Dec 1905, Canewdon. 1861 Census living with GParents Henry and Elizabeth Codlin. Following Sarah's death Jimmy moved to Pleasant Row, Great Stambridge, Essex. 1865 Witness at the wedding of his brother Henry to Sarah Ann Rust. No other children living in the House-hold. 1881 census lodger George Griggs farm, labourer. 20yrs. E. Winch, Norfolk. 1891 Census known as William J. Valentine. Medical Information: Informant: Violet Alice Locke, daughter, present at the death. ii. SARAH VALENTINE, b. 1843, Petney; m. WILLIAM LAWS, Apr 1865, West Bilney; b. East Winch, Norfork England. iii. JOHN VALENTINE, b. 1846, West Bilney; m. MARY ARTHUR, 1869; b. 1844, Dorking. iv. ELIZABETH VALENTINE, b. 1844, Pentney; m. JOHN EDWARDS ?. v. HENRY VALENTINE, b. 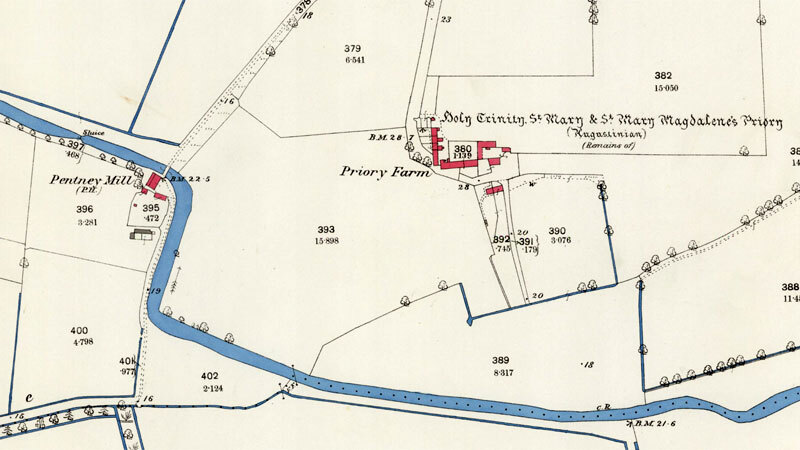 06 Mar 1839, Pentney; m. SARAH ANN RUST, 1865; b. 1842, Middleton England. Kelly's 1892: William Storey, Pentney Mill P. H.
Kelly's 1896: Charles Bunfield, Pentney Mill P. H.
Kelly's 1900: Charles Bunfield, Pentney Mill P. H.